This 45 gallon Li'l Herc Repro 1.5 mil-thick low density garbage bag is made of recycled plastics and resins which make it economical, versatile and strong. Low density garbage bags are more stretchable and give more easily than high density bags, because they are made from resins that are resistant to puncturing and tearing. Low density garbage bags are also comparatively thicker than high density garbage bags. Perfectly suited for wet, heavy trash or sharp irregular shaped objects from bars, kitchens, and catered events, this liner has a reinforced star-sealed bottom for added durability. Great heavy duty trash bag! It even holds liquids in. Fits our 40 gallon trash can perfectly without over filling the bag. This is a great quality product. I'm still amazed! Ordered these after receiving an earlier order of heavy duty bags that were far heavier than I expected. Opened these up, and, wow! These are still plenty strong for our needs. Great value in trash bags right here. Cleaning crew tried this out and really liked them. Great quality and they hold up really well in an industrial environment. Price is excellent on these. Large and sturdy garbage bag that fits all of our large containers. They do not rip or break easily and can hold large amounts of liquid. none better!! good value, and they come in rolls of 10. my customers like to buy single trash bags. I sell them by the roll for 5 bucks, and I sell enough to pay for all the ones that I use. you will love the quality. Great Trash bags! These Lil Herc Repro 45 gallon 1.5 mil low density can liners are the best for Slim Jim Trash cans. W've tried the 33 gallon and it was just too small. These 45 gallon ones do the job better! These bags are the perfect size, and the 1.5 mil thickness means we don't have ripped bags anymore! Highly recommend using the low density bags for day to day restaurant garbage use. A quality product! I bought it for a great price. I haven’t had an issue with the trash bags, none of them had any punctures or anything! Excellent bags for the price. Have only had one that tore, and we do put them to the test. We will be buying these again. The Li'l Herc Repro Trash Bag 45 Gallon is the best thing next to sliced bread. It holds heavyweight trash. Most other bags leak or break and this one has been tested and its tried and true! These are nice trash bags, they hold a lot of weight and do not tear easily. We stuffed them full of leaves and yard debris and they held up nicely. Great price for these liners. They are thick and don't tear easily at all and we are tough on trash bags. Happy to find them on here. These are really, really strong! Significantly cheaper than comparable ones from our foodservice provider, and they hold up to lots of heavy, wet trash. Great buy. Nice solid trash bags. Works well for us since we don’t use grease or liquids a lot. Maybe would get a thicker one if you have an issue with those. Otherwise great bags for the price. Absolutely LOVE these bags!!! We have struggled to find a thick quality trash bag that would hold our trash without ripping/tearing. What a cost value as well - highly recommend. The Li'l Herc repro trash bags are great size for our company break rooms. The 1.5 mil bags are strong and sturdy and no more worrying about leaks or bags tearing. Very pleased. These 1.5 mil can liners are a heavy duty trash bag perfect for any bar or restaurant. 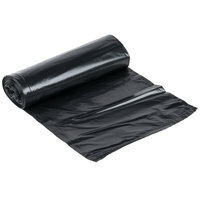 These are a 45 gallon liner made of thick black plastic. The one hundred count case of forty-five gallon low density can liner Li’l Herc Repro Trash Bag has worked well in the commercial kitchen and also the residential household. Their durability is far better than others I have tried in the past. I appreciate the bulk purchasing option as well and would order again. We needed heavy duty trash bags for our wedding reception and these were excellent. They are tough and can hold heavy glass and plastic without ripping. Ordered this product to try to find a slightly cheaper alternative. These ended up being cheaper and .3 thicker than from our vendor. overall very pleased. These trash bags hold up extremely well, haven't had one break or rip yet! The price cannot be beat, we would recommend these bags to someone looking for quality large bags. The Lil' Herc trash bags are large and thick and make great bags for our restrooms cans. The can liners are a great price and work really well for us. These are great heavy duty trash bags! I needed them by the bulk which is so much better & cheaper than I was having to buy before! Great product! I used these trash bags for clean up for a party recently. They were great for handling all of the disposable items that I bought from webstaurant, making for quick and easy clean up. The price of this item is also much better than the other comparable products that I saw on other sites. Swapped over to these trash bags in order to save a few bucks. Actually like these better than ones we got from food vendor. Heavier duty than expected. Will buy more. I used this size of trash liner in a 33 gallon size garbage can and it worked good. It's a little larger than the 33 gallon size, but works OK.
For me it is all about price and efficiency, and these bags cover both bases. They are an awesome price which sometimes means they are cheap, but that is not an issue with these. I use them to trash food products, and they have never ripped due to weight or sharp edges. Perfectly reasonable equivalent to any trash bag a national band will try and sell you but at nearly half the cost! These bags are the same as you would find to fit a 55Gal trash can. These bags are a big upgrade from the bags I was using before. The only concern you should be aware of is shipping cost. For a relatively light package the shipping is more expensive than normal. Otherwise these are great bags and I recommend them. We empty a lot of trash with glass bottles among other things. These bags are very sturdy and the packaging was perfect. Each contained 10 rolls of 10 bags each. Very easy to determine when reordering is necessary. Great value! Webstaurant store does it again ! Found it here at the webs store where you can find the largest selection of restaurant goods from one location! And the price and quality is outstanding , not to mention the great cust service. This review is on the 45 gallon low density can liner 100/ box. We purchased it for the great price and customer reviews. 5 stars! These bags are fantastic. I was very hesitant when we first got them because they look so thin, boy was I wrong! We stuff these tight at every job and never split them. We love these and will continue to use them as long as we can get them. I have used other trash bags but none are as durable and cost efficient as this bag. You will not beat the price and quality from this product. What can I say? I keep order and order again! Easy in my budget and mist of all they are string bags. Order and try it! These are excellent trash bag for the price. We've been using them for a couple years. If you put to much weight in them they will tear, but that is almost to the point were one of your employees may hurt themselves trying to get it into the dumpster. I would rather have a bag rip than a hurt employee. I would buying them again. Wow, love these trash bags! So strong and durable but I must say that I didn't notice a big different in size going from 33 to 45 gallons. Will continue to purchase these for sure for the price. These are a durable, sturdy trash bag. They are reliable and hold up super well. We are impressed by the quality and durability of these trash bags. We'll be buying them again! Used for the first time and will only use from now on! Very strong! Doesn't rip or tear. These trash bags go above and beyond the call of duty on strength and quality. These bags are a good size trash bag for our restaurant. A good price for a great value, will never buy anywhere else, happy customer! We were going to purchase another brand of bags until WebStaurant recommended these. The one thing that caught my eye was they were slightly cheaper and eco-friendly. I was a bit worried at first, but after testing them they are amazing! They hold a lot of weight and are extremely easy to tie and toss. Great recommendation and a lower cost! Have been using these trash bags for years and will hold up very well to almost everything. Tall bags allowing for easy tie up. When puncher it is still pretty hard to tear. These bags are large and easy to remove from the roll. They could stand to be a little thicker if using in a commercial kitchen. We have had a few leaks after removing the bag from the trash can. Perfect if you wont be filling with liquids. These are very good bags we use for everything! We have put A LOT in them and have never had a problem with one breaking! Very good quality garbage bags. Nothing is worse than a full garbage bag breaking in the kitchen on its way out. Dont skimp on thin bags, it will cost you for sure. These bags are such a strong gauge and they are so comparable to the older brand we used to purchase! Our employees have compared the two and they rank this brand from webstaurant.com the best! Thanks for such great quality products! These bags are BIG. If you're looking for a tiny, tiny trash bag, look elsewhere, but if you've got a heavy duty trash can that need bagging (like my restaurant) I absolutely recommend picking up Li'l Herc Repro bags. Never had any rips or tears. Like all choice products, this is a top of the line trash bag. Great price on this 100 case lot. We use them in all of our cans. These bags are perfect for our garbage in the kitchen area. Very durable, haven't had any break or rip and we can have heavy garbage! Good price for trash bags. Can't really complain. All the garbage we handle is pretty light weight so the bags hold up nicely, when you compare to other bags. The L'il Herc Repro Trash Bag Low Density Can Liner for 45 Gallons is a good, strong bag that is a great deal price wise. We are a small business that has to be very cost efficient. These bags are great for large amounts of garbage. Our best use is to use them to cover our working surfaces. Great trash bags! These are quality bags at a bargain price! Thank you for saving me so much money over the course of a year! Great bag for the price. Allows you to use them in garbage cans behind the bar and at server stations without worrying about them breaking if they become full. These are greattrash bags, a little big for a slim jim but thats nice when they are full and you need a little extra grip to pull them out. Heavy Duty, been using them for a few weeks and haven't had a blow out yet. These are very strong (and I mean super strong) trash bags! They can hold a lot of trash! We use them to carry dirty towels as we wash them ourselves! No struggle or worry about the bag breaking!! The 45 Gallon 1.5 Mil Low Density Repro Can Liner/ Trash Bag comes in 100 per case.It is very thick and holds alot can you imagin how much food wast weighs in the kitchen. They get very heavy hold up very heavy. This is a very strong garbage can. When you have food waste that builds up over the day this is one bag you can count on not to rip and spill. These garbage bags are just what I have been looking for at a great price and very speedy service! I will definitely order again. Thanks! These liners are over 50% cheaper than the ones I had been purchasing. Also, they are .25 mil thicker which is a plus since they are used for break room, shop and warehouse trash containers. These are exactly like the bags that we have been purchasing from another supplier. The only difference is that these are cheaper per case then what we have been paying. What a great deal!